Madden NFL 19 introduces a plethora of new options this year for the annual sports series. EA has done another fine job of refining features while still making sure this entry is worth picking up. The return of Longshot, more solo options for MUT, and a new player movement system makes this an excellent addition to the series. If you’re a longtime fan or looking to get back into the series, Madden NFL 19 is a fantastic pick up. The changes from last year are readily apparent as Madden NFL 19 introduces Real Player Movement. In case you couldn’t guess by the name, the goal was to improve player animation so they look more lifelike on the field. This was definitely successful. Running across the field has never been easier or looked this good. I found this especially prevalent when running the football. In past games, running the ball could feel like you were locked into certain routes, making it hard to hit holes as they open up. This year, that problem is eliminated. I had no problems navigating the ball carries and getting him exactly where I want. This leads to fast, fluid gameplay that is consistently exciting. Along with the Real Player Movement is a new air-collision system that makes it far more difficult for players to to just jump up and catch the ball over defenders. Now they get hit hard, and often drop the ball. Beyond the new Real Player Movement, not a whole lot is touched in terms of gameplay. Understandably, the developer doesn’t want to get too crazy with a successful formula. If you have played past games, you should feel right at home here, for better and worst. Playing offence is still a fantastic experience; defense is less fantastic. You can’t possibly control and entire team, so it is a lot of hoping your people will be in the right place and don’t leave someone wide open for a huge gain. Controlling the individual players is a fun and satisfying experience. I could always get to the quarterback or running back if I correctly timed my moves. Everything, from offence to defence, is focused on timing. Diving for balls or running perfectly on a snap are all skills to develop and lead to incredibly satisfying sacks and catches when performed perfectly. While luck will always play some part in sports game, impossible catches are just a part of the sport, Madden NFL 19 does a great job of putting skill first. Offence and defence both have a variety of options to get the job done. The offence is loaded up with a variety of different skills to move the ball. The quarterback can throw low, high, bullet passes, lobs all with simple buttons presses. The challenge comes from learning to properly read the defence to see who your best option to throw is and which pass will get the ball to him. An ill-timed low throw will get swatted or intercepted while a bad high throw could sail over the receiver or cause an injury as the receiver takes a big hit as they stretch to make the catch. The receiver has a few options themselves to help keep the ball moving. Tight passes along the side-line may require a safe possession catch where the receiver only worries about catching the ball. You also have aggressive catches which you can do in space to keep moving and gain yards after the catch. There’s also the ability to leap into the air to grab higher catches and pull off some highlights. Madden NFL 19 is back with a familiar cast of game modes. Longshot makes its return this year as it continues the story of Colt Cruise and Devin Wade. This is by far my least favorite mode, as it’s just a drama where you occasionally play football. It’s much more fun to skip the cutscenes and play some football. The story is told well enough, but I didn’t connect with either of the characters and an intricate drama involving long-lost relatives is rather out of place for this series and is more cumbersome than enjoyable. MUT solo challenges are a great way to start building your team. Franchise is also back, where you create your own player, coach, owner, or take control of an active player. This is by far more engaging than Longshot, but still lacks depth. You just go through the week doing training and playing games to gain experience to level up your player. That’s it. Its nice that you have options for your player, such as coming in undrafted, low draft, or high draft which impacts your rating and the rate you gain experience; but it would be nice if EA took some cues from 2K and started integrating more off-field experience to make it more immersive. As usual, Madden Ultimate Team (MUT) is where most of the effort went. MUT is jammed packed with activities that are all enjoyable. The new solo challenges gives you a nice way to build your deck by completing specific goals. This could be running 10 yards within three plays or stopping the offence form completing two passes in a drive. This is a great place to start to get used to how everything works and get the hang of everything. The new team captains gives you something to work for as they can be the best players in MUT but need leveled up through training to get there. 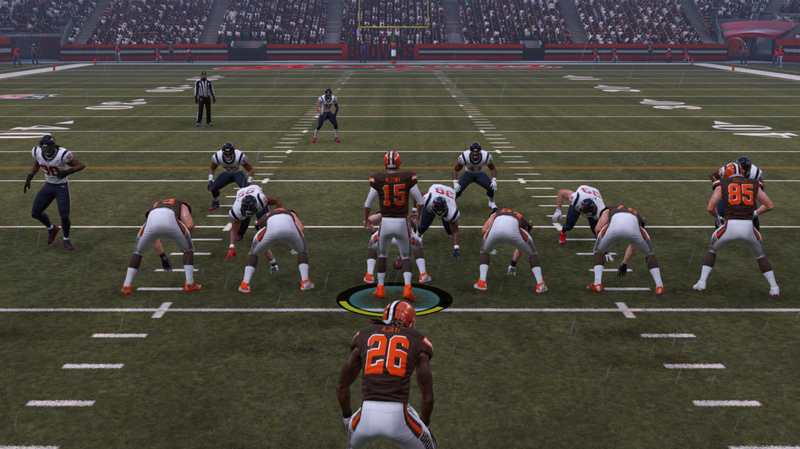 There are also solo battles where you play against the CPU using user-created lineups. MUT Draft also returns which has you picking players from 20 rounds to draft the best team you can from a limited set of players to play against other players or the CPU. You can of course take your MUT team and take the field against other players or team up with your friends to complete co-op challenges. When I took the game online, I experienced few issues. I bumped into a few connection issues and some lag, especially while kicking, but nothing major. Creating the ultimate team is as satisfying as ever. There is so much content that MUT may as well just be its own game. The new training points allow you to not only improve your team captain, but also other players on your team by unlocking different chemistry sets. The more players share a chemistry set, the better they are. This means the more players that have Power Running active, the better the stat boost is. This leads to some interesting strategy in MUT challenges, especially the more difficult ones. The only thing I don’t like about MUT is the pay-to-win elements. Players have the option of just paying cash for an in-game currency that allows them to buy player packs to improve their teams without playing a single game. This isn’t as big of a problem with addition of more single-player content but being able to just buy a better team takes some of the spirit out of it. Madden NFL 19 is a fantastic entry into the long-running series. The new Player Movement System and air collision system lead to far more fluent gameplay and animation while MUT comes in better than ever. The MUT challenges are enjoyable and offer a great way to start building your team and a new emphasis on training and chemistry allows for more strategy. New or returning, Madden NFL 19 is a must buy for football fans. Austin Fern has been playing video games his entire life. The first console he truly fell in love with is the PlayStation 2 with Sly Cooper, God of War, and many others really leaving an impression. He enjoys all genres of games from FarCry 5 to Danganronpa and everything in between.